The wide spread use of smartphones provides us large scale location data. 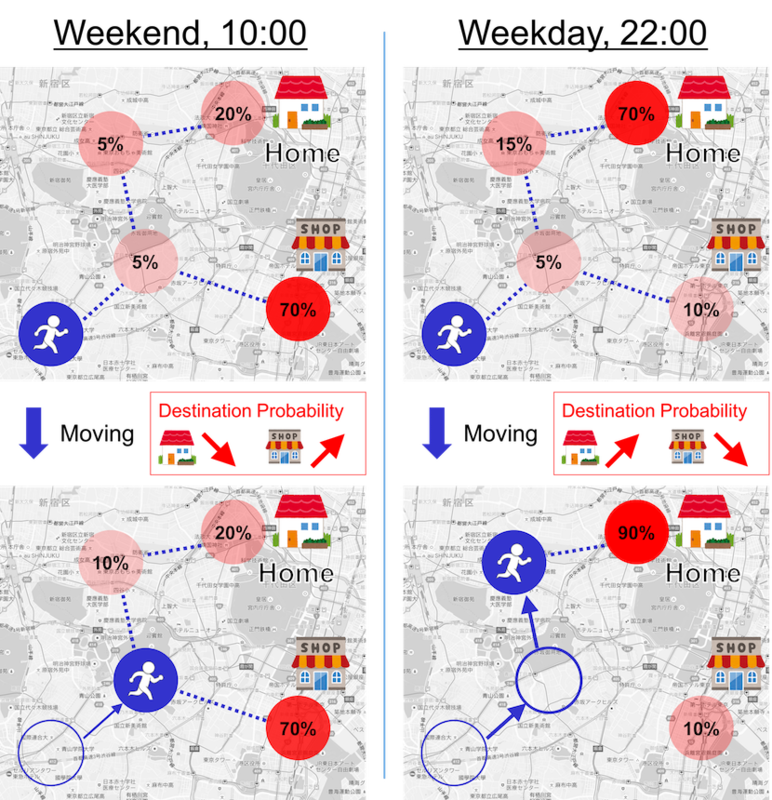 Analysis of location oriented data enables us to predict location destination of users. Specifically, by predicting destinations at early stage of each trip, location specific online advertisement before reaching the destination will be feasible. This technology will also be helpful for much smarter home electronics management (e.g. HEMS, BEMS) where energy consumption is preferred to be smaller while keeping one’s comfortability. Traditionally, there are two conventional frameworks for destination prediction and some technical trade-offs are found in this field. One is known as Next Place Prediction (NPP) model, the other is based on trajectory tracking models. NPP achieves accurate destination prediction thanks to user cyclic behavior trend while it is not trivial to modify recognition results once the user trip is out of its base cyclic trend. The latter trajectory based tracking achieves the accurate recognition once the trajectory is fully exploited and importantly, the recognition result is adjusted by its trajectory incrementally, whereas the recognition accuracy is sometimes poorer than NPP in the early stage of each trip. To solve this problem, we propose a new statistical model to integrate advantages of the two conventional frameworks. Our model factorizes the complicated destination prediction process into two parts: NPP and trajectory based tracking model. As preliminary result of our modeling, we employ maximum entropy inverse reinforcement learning (MaxEntIRL) for trajectory tracking model, and showed our superiority compared with the traditional two approaches [Konishi and Shimosaka@SigUbi49, only Japanese] in train exchange use-case. In addition, we expand the preliminary model for general purpose use-case such as car navigation, route guidance for pedestrian as well as train users. Specifically, we employ SubSynE model instead of using MaxEntIRL [Imai+@imwut, vol.1, no. 4] and found that our model achieves good results compared with the traditional approaches using over 1.6K users in commercial IT services.